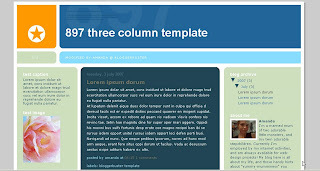 I've customised the 897 Blogger template to feature 3 columns (instead of the usual two) which you can download for free here. I've altered the sidebars so both are rounded, and have also taken care of the margins so the elements don't run into each other. To download, right click the link below and choose "save as" to save the template to your computer. To upload the template to your blog, go to Template>Edit HTML and look for the section at the top where you can browse your hard drive for template files.